Want to impress your sweetheart this Valentine's Day? REALLY impress your sweetie? Then make these éclairs. They look like they'd be a ton of work, don't they? I thought they would be, but they really aren't that hard. From first flipping open the cookbook (the 1997 edition of the Joy of Cooking) to the moment I was getting blissed out eating them was under two hours. Not bad at all, and fresh out of the oven these were the best éclairs I've ever had. 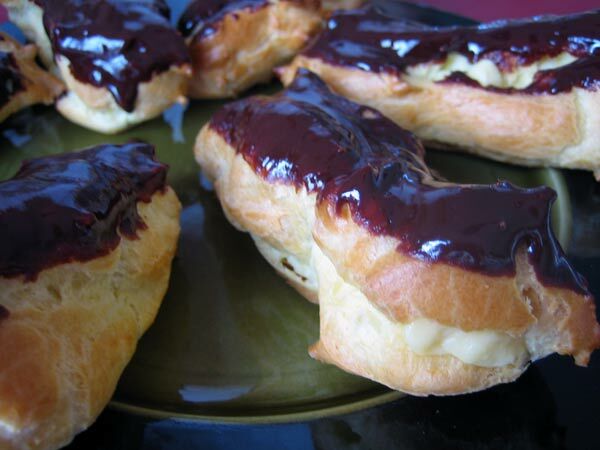 There are three parts to éclairs: the pastry (pâte à choux), the filling (crème pâtissière), and the topping (chocolate ganache). If you are strapped for time you could cut corners on one or more of the parts by doing things like using frozen puffed pastry for the pastry, pudding or whipped cream for the filling, or some other frosting for the topping. Take a look at the recipes before doing so though: none of the pieces are that hard. There are a few places where you have to bring things to a boil carefully to prevent scalding, but I've found that if you warm the ingredients in the microwave before combining them in your sauce pan you can easily cut 10 or 15 minutes of stirring out of the process. 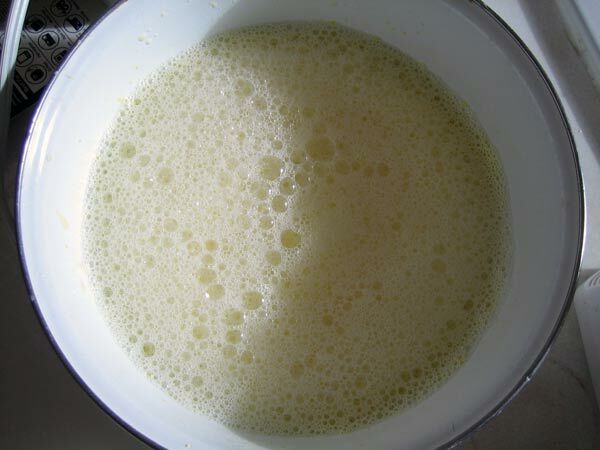 Combine the water, milk, butter, and salt in a small saucepan. Bring it to a boil. Stir in the flour and, while mixing, cook another minute or 2 to eliminate excess moisture. Transfer to a bowl and let cool for 5 minutes, stirring occasionally. Beat in one egg at at time. When they have all been beaten in and the paste is smooth and shiny, set aside to cool. The paste may be use immediately or covered and refrigerated for later use. Combine the sugar, flour, corn starch, and egg yolks in a bowl. Beat with an electric mixer for 2 minutes until the mixture is thick and pale yellow. In a small saucepan, bring the milk to a boil. Gradually pour the milk into the egg mixture, stirring it in as you do so. When fully combined, pour all of it into the saucepan and bring to a boil, whisking constantly. Boil for 1 to 2 minutes then remove mixture from heat. Stir in the vanilla and set aside to cool. Cover the top with wax paper or parchment to prevent a skin from forming. This cream may be refrigerated for a day or two before use or used immediately. Heat the cream. 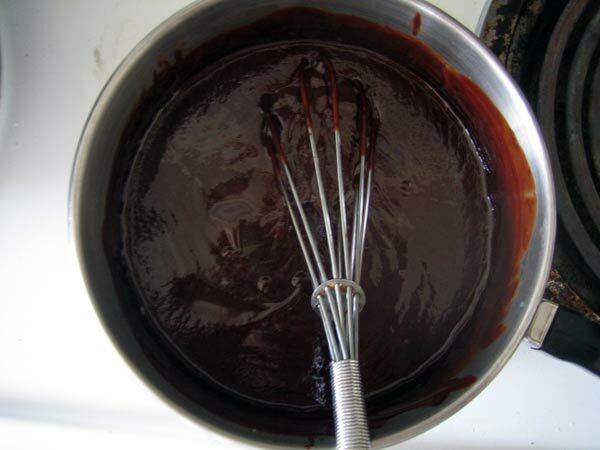 Stir in the chocolate and continue heating and stirring until all of the chocolate is melted. 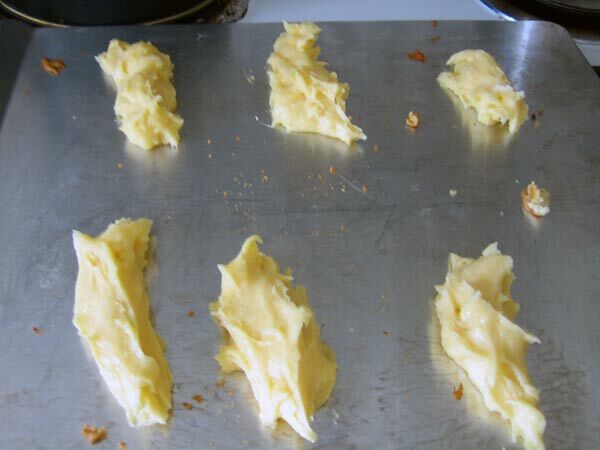 Form small logs out of the Choux paste on a baking sheet. If you have a pastry bag with large tips, you can squeeze them out neatly. I do not, so I just formed the logs with a spoon and my fingers. These were about an inch across and 3 to 4 inches long. Bake the pastries for 15 minutes at 400 degrees. Reduce the oven to 350 degrees and bake for another 10 to 30 minutes, depending on the size of the eclairs you are making. When they are golden brown, turn the oven off. Poke a hole in the small end of the eclair and place them back in the oven for another 10 minutes to dry out. Remove the eclairs from the oven and let them cool a few minutes. 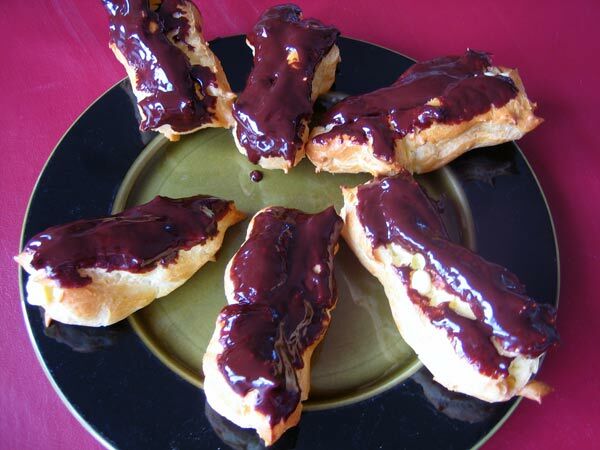 For the topping, dip or dribble the eclairs in the chocolate ganache. 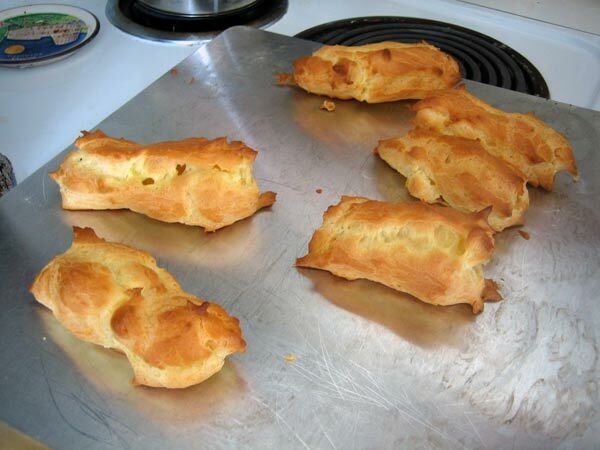 To fill the eclairs, you can either use a pastry bag and squirt the pastry cream in through the drying hole as I did. 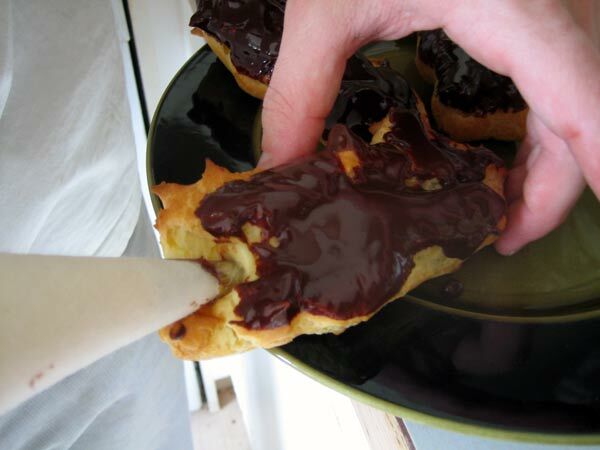 Or you can slice the eclairs lengthwise and scoop the filling inside and place the top half back on top. There you have it: chocolate, creamy bliss. The eclairs keep OK for a few days in the refrigerator in an air tight container, but they are not nearly as good as when they are first assembled. Take my advice: make all of the elements in the same session, bake them up and make a fresh pot of coffee, and enjoy them immediately. You won't be sorry! Related Recipes: Pain Rapide au Chocolat, Brioche. I myself prefer the large nylon washable bags, Tala use to make them along with large tips. To avoid having your choux shells collapse, bake them until the color of the cracks in the dough are as brown as the rest of the exterior. By doing so you really don't need to poke holes to let them dry. To make the pastry cream easier to pipe, take it out of the fridge 45 minutes to an hour before you use it. Then whisk it aggressively. 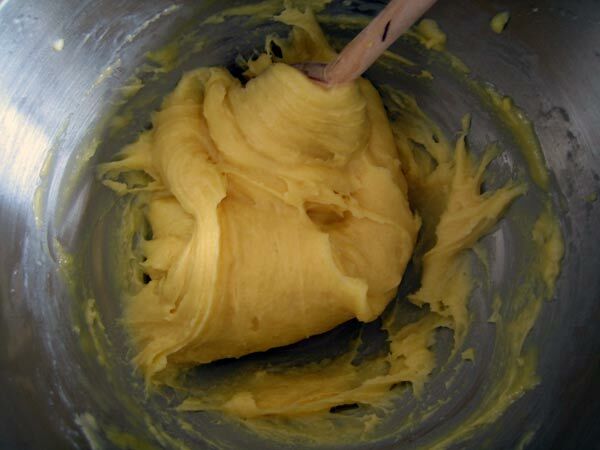 It's texture will change from a wobbly, rubbery state to a smooth cream. Finally, try folding about 1/3 (by volume) of whipped cream - soft peaks - into the pastry cream. It's called "Diplomat Cream" and it's a super delicious alternative to straight pastry cream. floyd, I was JUST searching for a profiterole recipe on google! lol. I come here and see eclaires and now I ned a cloth to clean up my dool!!!!! And what for their wandering eyes did appear? Picture this: A table with two pots full of pudding, vanilla and chocolate, and a fresh hot cookie sheet of round little puffs being added to a heaped shallow basket of cooling puffs. Whip cream and chocolate to dip. It doesn't take much to imagine what spoonfulls of fun everyone had making and eating their own little snacks. :)! Tip: Plastic tablecloth and lots of napkins. I feel silly asking, but what is patent flour? Lower gluten, or something else entirely? I've been wanting to try these, but didn't dare attempt it without dairy (has to be, in my house). Your changes have encouraged me, but I didn't want to make them too tough using the wrong flour! if the flour is stronger you would just add more egg in this mix till you get the mix as stiff or as soft as you want. first bleand the eggs like you are making scrambled eggs they should look like one yellow liqued not yolks and whites. 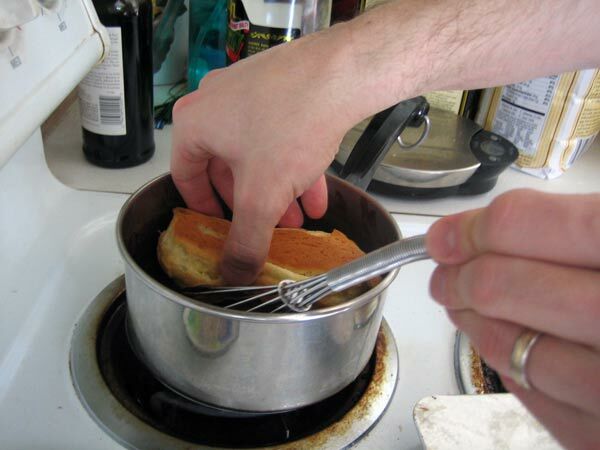 dont worry as you add eggs it will get smooth. For the icing use powdered sugar water and cocoa powder to make an icing that is about as thich as melted chocolet and warm to body temp and apply it will dry as it stands. ONE of the bakeries i worked in was kosher parve. Well now I have no excuse; I'm making eclairs this week! My son asked about them recently and I had to put him off because I thought butter was crucial to the pastry part; what a nice surprise to find differently! I just wanted to thank you for this recipe; I didn't feel like having a cake for my birthday this year, so made these instead. What a hit! In fact, the whole family said to say thank you! Thanks also to Norm, who indicated oil instead of butter in the pate a choux; it never would have occurred to me to try these without dairy, but having seen that, I realized the cream would be easy to convert (I used a mix of 1/3 each coconut, rice, and soy milks instead of real milk), and they were wonderful! Thank you so much, these were the high point of my birthday! How do you fill them? I think I underbaked mine too, though only slightly; they were a little light in colour, but they also kind of sagged after I took them out. Not enough to prevent filling, but they weren't as dramatic as when they first came out, either. Didn't affect the taste though! You said you don't poke holes in yours; do you split them to fill them, or is there another secret? You don't have to poke a hole ahead of time - if you're using a pastry bag with a metal tip, you can poke and fill in one fell swoop! I made these this weekend and I give them 5 stars easy and fun to make. I've been trying so hard to ignore it since I first discovered this web site and yet here it is again. Tyring to learn how to make a nice croissant is already starting to hurt. Not sure I can handle having to make batch after batch of eclairs! All I have to say is WOW. I was having a bunch of friends over for dinner last friday so I decided to try this recipe for desert. I made the shells Thursday night as I knew that the oven would be occupied with the Prime Rib most of Friday afternoon. I made the Pastry cream and the Ganache on friday and filled the shells. All I have to say is these were the most amazing eclairs I have ever had. Best compliment of the nght was from a chef who workes at a 5 star restaurant here on the srtip in Las Vegas who said he wished his pastry chef could make eclairs like that! This will have a prominant place in my recipe box from now on. I was amazed out how well these turned out, especially since I have only been baking for 4 weeks now. I never would have thought I would be making eclairs but compared to some of the other recipes I have dove into lately the eclairs were fairly easy. I did however combine a few of the comments into the recipe as well as adding a few touches myself. I used the oil instead of butter and bread flour instead of AP. When the cream was finished I though it tasted wonderful but I couldn't resist putting in 1/2 teaspoon of cinnamon and a few dashes of nutmeg to please my taste buds. I also made some fresh whipped cream to incorporate into the cream just to give it some fluff. I baked them at 450 until a deep golden brown throughout, approx 30 mins but dont hold me to it, so there was no need for poking holes. Awesome and easy recipe! Would...will make them again soon! If you don't have a pastry bag and large tips and are shaping the dough with a spoon, if you wet your fingers and pat a little you can smooth it out easily.